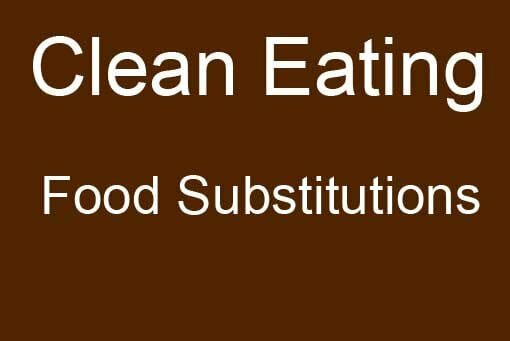 Looking for a clean eating food substitution chart? This one is a list of random substitutions I came up with and will update over time. I hope you fine is useful! If you have any particular foods you’d like to have clean substitutes for, please leave them in a comment below and I will do my best to find a substitute and add it to the list here. White Sugar Baking/Cooking Honey, Maple Syrup, Sucanat, Coconut Sugar See my sugar substitution chart for help with converting sugar measurements. Brown Sugar Cooking/baking Honey mixed with a bit of molasses You can make the flavor as strong as you like, just remember that a little molasses goes a long way. Corn Syrup For hardening (candy) Brown Rice Syrup This will not harden like corn syrup will, but it’s the closest thing you can get to corn syrup with out using corn syrup. It remains slightly sticky. White Flour (A/P Flour) For cooking/baking Whole wheat pastry flour or WHITE whole wheat flour Whole wheat pastry flour is best for things that need less gluten, like pie crust. WHITE whole wheat flour is better for things that need more gluten, like bread. It will produce a very “bready” texture in your finished food. Good also for thickening soups. Butter Cooking/baking Heart healthy oils such as olive or avocado oil or purchase organic butter from cows who are grass fed and pastured. (Butter is not "unclean" in and of itself. But if you want to avoid it, this is how I do it for most recipes) While not all recipes will handle oil, many will. However, this substitution will NOT work on items that are dependent on butter for form or texture. Things such as croissants will not work with oil. It’s far easier to make this substitution in cooking than in baking. If you are baking something that simply includes butter but does NOT depend on the butter for form or texture, then usually a mixture of unsweetened apple sauce and oil will do the trick. Usually 2/3 apple sauce with 1/3 oil. Baking Powder Leavening Baking Soda Baking soda is too “salty” for some recipes. For this reason, I continue to use baking powder. 1 or 2 tsp. of baking powder in a recipe is not the end of the world. Sour Cream Cooking/baking Plain Greek yogurt Substitute in equal amounts. Barbecue Sauce Grilling/baking/slow cooker recipes This is my clean version of BBQ sauce. If you prefer to buy them, Bone Suckin' Sauce is an excellent and clean sauce as well as the OrganicVille brand. Both can be found at Whole Foods and other retail stores. Pizza Dough Pizza This is my clean version of pizza dough. If you need a gluten free version, try this recipe from the Gluten Free Goddess. Condensed Milk Coffee and baking. Condensed Milk Coffee and baking. Jessi – I haven’t researched it much, but was told that there is a lot of processing involved. I have to look into it more, but thought I would add it for those that don’t use it. What is wrong with baking powder? Regalla – I haven’t researched it much, but was told that there is a lot of processing involved. I have to look into it more, but thought I would add it for those that don’t use it. You’ll want to find aluminium free baking powder. Some baking powders contain cornstarch – if you avoid all corn like I do then you’ll want to watch for that too. You can use coconut oil instead of butter (but IMO there’s nothing wrong with butter). I use spelt flour in place of wheat flour (much less gluten and more nutrients plus a great flavour, you won’t go back to wheat) in all my baking. This is the only “clean eating” site I have seen that says no to butter. What’s the story there? And also most don’t endorse nonfat yogurt because of the extra stuff they usually have to include in it to make it have a yogurt-like texture if it’s made from nonfat milk. Emily – This blog is what I personally eat. Do what works for you. Everyone has their own ideas of what clean eating is. That’s what makes it great. As far as I know, there are no added chemicals to non-fat Greek yogurt, which is what I eat. 1. There is mounting evidence that agave is very processed, so I stopped using it. I know plenty of clean eaters who still use it. It’s a personal choice. 2. Again, this is a personal choice. In limited amounts, it’s fine. But I personally don’t eat it. That’s just how I eat. I do know clean eaters who use butter. I’ve always made my own baking powder. Sift together. Store in airtight container. One teaspoon of this is equal to 1 teaspoon store bought baking powder. Haeley – I use baking powder, but some clean eaters do not. It’s a personal choice. Same thing with the sour cream. I personally feel it’s too high in fat to be part of my eating plan, others do not. I use Evaporated Cane Juice (Organic Cane sugar). Wud that be included in Clean Eating instead of white? I also do use Coconut sugar, but wondered abt the former since it does not involve using any chemical processing/GMO etc. DK – I’m currently working on an article about clean sugars. I don’t know the answer to your question yet, but it is something I’m researching. So if you can hang in there with me just a little longer, I’ll be able to answer your question soon. Oh sure 🙂 Thank you so much. Appreciate the reply. Ive heard of using banana in baking instead of the butter/sugar base in items such as cookies. Ive not done this myself and do not know the amounts. I plan on experimenting soon though. Crystal – It works! I’ve played around with it a bit myself, and it truly does work. Not in every single recipe, but in most baking recipes it does well. You just have to expect the banana flavor. It’s not terribly strong, but there is an undertone. A few things, I may have some insight on some questions here!! Sugar by the FDA’s standards is considered a drug, it runs through your body much like cocaine and has similar damaging results. Evaporated cane sugar, organic sugar blah blah it’s all the same thing, raw honey, coconut palm sugar, and pure maple syrups are the closest you can get for baking. Some stevia’s are “safe” but you have to pay attention to labels and know what to look for. Yogurt all around is incredibly horrid for your body seeing as we are not cows and cannot digest or process the dairy. I am very sorry if this is offensive and I would like to state that I adore this site for all it’s clean eating help, you do an amazing job and I hope you stick with it!! Charlene – Everybody has their own approach to clean eating. No matter how strongly you feel about a particular topic, somebody somewhere feels just as strongly about the opposite side of the argument. We all do the best we can for our bodies. For some people, that includes dairy. You may see it as not healthy, but others do, and that’s okay. I totally agree on the sugar however. I am looking for s substitute for mayo. I have a recipe for mushroom, beef, and swiss pizza that I wanted to use the pie crust recipe that you have listed and ground turkey instead of beef but one of the ingredients calls for mayo and I didn’t want to use mayo. Any suggestions?? Actually, baking soda and baking powder are both very high in sodium. I use ground flax seeds as a replacement together with the eggs cause I rarely use eggs whenever I bake 🙂 Just sharing, hope this helps. Thanks so muh for all this advice! I constantly make your recipes. I am new to clean eating and love it! Needed a sub for no butter for my son’s birthday cake. Hope it turns out ok! Desiree – I have a birthday cake recipe on my blog if that helps. do you have s substitute for soda in recipes that call for dark sodas? i have a recipe that calls for coke/dr pepper/root beer. I think it is just for the carbonation but i’m not 100% sure. it is a alow cooked-bbq pork recipe. Tricia – I can’t be sure, but I would almost be willing to bet that you could use a combination of plain mineral water and molasses. Typically, that addition is primarily for sweetness and flavor. But I don’t know if the carbonation really makes a difference or not. I might have to experiment with that myself a bit. I would like a comprehensive list of what can be substituted for eggs in various types of recipes. One type of substitute does not work well in all cases. Thanks! I know this is an older forum, but I use ground flax seed meal for an egg substitute. I believe it’s 1Tbsp flax seed meal and 3 Tbsp water, mixed together and let set for about 30 seconds before adding to recipe. I’ve used it for cake, cookies, brownies, waffles, pancakes, cornbread, and other misc baked goods. Rachel – I’ve heard that too but haven’t tried it. Is that supposed to equal one egg? Do you have a recipe for Pumpkin Bread? I have been doing some reading on coconut palm sugar. Have you read anything like this or done any research? Ashley – Not yet. I’m in the process of looking at different sugars, but haven’t looked at this yet. Shelagh – Ya, that’s a great substitution! Any suggestions for substitution for mayonnaise in a pasta salad or broccoli salad recipe? Marla – I’m working on a clean mayo recipe now. I hope to have it posted soon. The only real sub for it would be Greek yogurt, but that doesn’t really go with a lot of foods when you’re subbing mayo. I saw a lemon poppyseed muffin recipe that said plain yogurt could be used in place of buttermilk. I’d be interested to know if anyone has tried that. Recently made the best mayo I’ve ever tasted using ALL organic ingredients: E. V. olive oil; raw apple cider vinegar; pasture raised eggs; pink Himalayan salt. Clean for me, but may not be for others if they are looking to avoid eggs. Peter – Nothing wrong with eggs unless your vegan or allergic! Sounds yummy! I’d just like to point out that baking powder CANNOT be substituted with baking soda – they do not have the same chemical makeup, if using baking soda you need extra ingredients to activate it (acidic). You can however buy gluten free baking powder if that helps. When trying to eat clean, one may want to try and make substitutions for things that were made at home, especially dairy items. Organic cream can be turned into wonderful homemade butter (and non-cultured buttermilk as the byproduct of the butter making), and sour cream. Organic whole milk made into yogurt can be substituted in recipes instead of store bought yogurt (you can make it in a crock pot!) My philosophy stemmed from trying to get an autoimmune disease under control. When I shop I shop only for ingredients that can be made into something at home (ex:organic whole wheat flour, or occational unbleached white flour), if it comes in a package and can be eaten right there I don’t buy it. In other words if it doesnt take work at home to turn it into something edible I dont buy it. Of course we all make exceptions sometimes but this has helped tremendously! Not sure why butter is on the list below. Butter is as clean as it gets and actually contains some very healthy fats. Paula – Yes, butter is clean. But not everyone includes it in their eating plan. I’m simply providing options. I’ve heard a lot recently regarding coconut sugar – is this ok to use for clean eating? I just started clean eating (plus I’m gluten, beef, pork and soy free because of an allergy in my esophagus). Davi – As far as I know, it’s okay. As my knowledge grows, I may change my standing on that. But as I see it now, it’s fine. I’ve used it myself. Do you have any recommendations for mayo substitute in chicken salad? Gina – I make my own, clean mayo. But if you don’t want to do that, you cold try plain yogurt. But it will always have that “tang” that mayo doesn’t have. Hi!! I’m looking for an egg substitute. I think it’s ground flax and…. Something else, but can’t recall. Do you? Kris – There are so many variations for that, I’m not sure which one you may have read. Sorry. I would just google it. Is pure anise extract consisted for clean eating? I am making granola. The recipe calls for 1 cup oil and one cup honey. I would like to use coconut oil so what adjustments do I need to make with the oil and sweetener? Thanks! Mary – You would just use equal amounts of coconut oil, but I would measure it in liquid state to be sure you get an accurate measure. Just know that the coconut flavor will definitely be there. I’m not sure what you mean to switch with the honey. It’s clean. What other sweetener are you wanting to use? Im looking for the chart – it doesn’t appear to show up. Do you know how I can access it? Thank you! Jen – Thank you for pointing this out!! It’s an issue on the back end of my blog. Give me a day or two to fix it. I’ll get it back up and running. Sorry for the inconvenience! I am absolutely not to eat corn–on the cob, frozen, canned—what can I use as a substitute in Mexican recipes? Lydia – Depends on the recipe. I would just leave it out if it calls for whole kernel corn. If you mean tortilla, just use flour tortillas. My daughter has a coconut allergy, any ideas for coconut oil substitute? In any kind of recipe? Julie – Depends on the recipe. If the finished recipe isn’t dependent on the hardening factor of the coconut oil (like when you need chocolate to harden over candy), then any oil should work. I make BBQ sauce, receipe calls for 4 brown sugar. I understand molassas makes a “thicker sauce: How much lasses should I use???? Larry – I had to look this one up. What I found was this: 1 cup Molasses. = 3/4 cup Brown Sugar (firmly packed) But I’m not sure if that much molasses is a good idea. I would maybe mix in a bit of real maple syrup to offset it a bit. Otherwise the flavor could be a little off. All this basically liquify all day in the Crock-Pot. Really good. What do u think might be a good substitute for the sugar? Any input is appreciated. Thanks! Thanks! I guess I didn’t realize there was a clean sugar, I was under the assumption that all sugar (other than naturally occurring in fruits) was outside the clean eating options. Like I said, I’m still very new to this. My week 1 task is to try and feel optimistic instead of overwhelmed :). I will give those a try.